Loud Duck Design opened in 2008, so named after a rather noisy neighbour who sits on the pond outside our studio in Canterbury, Kent. We are a Graphic Design Studio with a passion for inventing and designing lovely original things. One of our first "lovely things" was the 164ft "Road On A Roll". 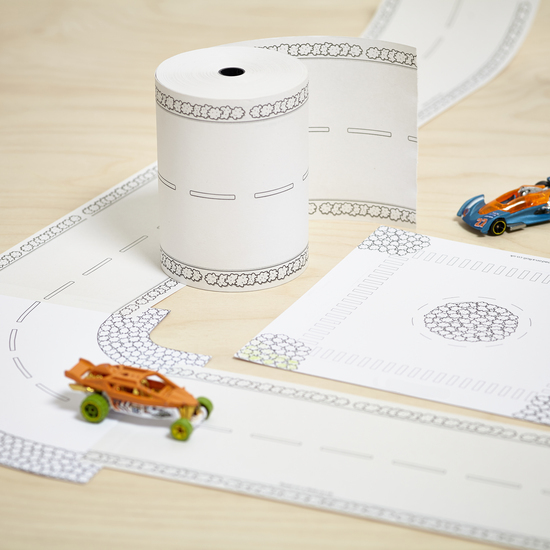 We set to work designing you the ultimate paper toy car track system. It can be easily and instantly made into any length and design track they can imagine. Around the house, out into the garden, now the track can go anywhere. Perfect to roll up, slip into a pocket, take on holiday or build a racetrack at the park. Our latest news is that we have a new graphic designer who is doing some amazing new "Pet translation Cards" his name is Spot and he has four legs so is amazingly fast with a mouse! At last pets can give their Dad a card on Father's Day, send a card at Christmas or celebrate their owner's Birthdays. Take a peek at our excellent feedback and customer comments on the menu to the left. © All designs and products sold by Loud Duck Design are © Loud Duck Design 2016 and may not be copied or reproduced without prior permission.